Jeff Johnson, the Republican nominee for governor, provided a glimpse of his leadership style May 15, telling a Tea Party group he would “go all Scott Walker on Minnesota” if elected Nov. 4. But what is it about Walker’s Wisconsin that Johnson believes is worth replicating? Collective Bargaining. One of Walker’s first moves as governor was to strip most public employees of their bargaining rights. Walker’s so-called “Budget Repair Bill” passed a Republican Legislature despite a series of pro-union protests that drew more than 100,000 to the Capitol in Madison. Dayton and DFL legislators, by contrast, expanded collective bargaining rights to more Minnesota workers, passing legislation last year that removed barriers to organizing for child-care providers and home-health workers who are paid with public funds. Already, the new law has extended the benefit of a union to more than 20,000 home-care workers. After voting to join SEIU Healthcare Minnesota in August, they currently are negotiating their first union contract with state regulators, marking the first time workers in the low-wage, female-dominated field have had a real voice in the terms of their employment. 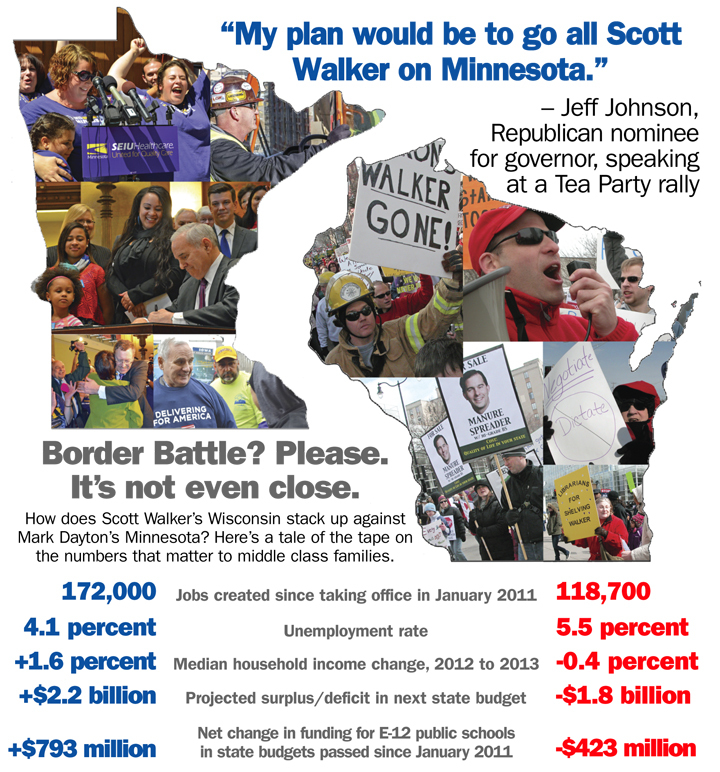 “We can’t let Jeff Johnson and his Tea Party extremists take us down Walker’s road to ruin,” Seide warned.